Exit the troll-beast. – Dirty wet dog , boats and sailing. 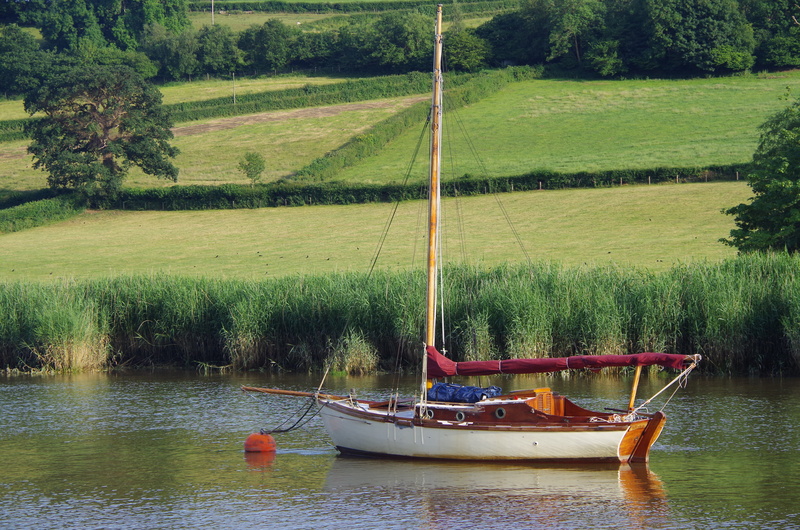 I guess that some of my visitors are now wondering what is going on here after all the posts earlier this summer about buying and then sailing a small classic boat and just as quickly selling it on. I thought i would give a more complete explanation of the last few months in a longer post which should also appear on the blog while i am in the immediate post-operative recovery stage myself. The time-line though is that i am writing the post a couple of weeks before my operation as things happen here but it won’t appear in the blog immediately. The short version is that Inanda is a very good example of her class and that i gave her a thorough testing in my voyage but that i don’t like her as a sailing boat at all. The sailing was a good experience though and with the delivery trip in her added to my early season return passage with the Liberty i have already packed in a lot of coastal/offshore sailing this year. The downside is that will account for just about all my sailing this year. The reality is that i sailed Inanda from Ipswich all the way around the coast to the Tamar river in Cornwall and most of the sailing was difficult upwind sailing in the channel. If you haven’t followed the story well what happened is that the wind headed me all the way around the coast and then went into the east as soon as we got home. A lot of the time the sailing was a 2-reef dead beat and only at the end did we have 2 days of light downwind sailing. What i had hoped was that Inanda would give me steady hull speed and an easy motion upwind, be easy to balance and would look after me a bit. There was a hint of that when i was beating across the Thames estuary , for a while i had the tiller pegged and was able to get on with navigating and making dinner while she made steady progress. That only ever worked in the relatively flat water of the Thames though, as soon as i was out into the channel and a bigger chop i had to fight her nearly every inch of the way. From being reasonably easy to balance she became a heavy and bad-tempered boat and very physically hard to sail. There were days when i also felt that she was working against me…..that odd sense that everything she could do wrong she would do in any situation. I wrote about my frustration with the furling gear which ‘trolled’ me continuously and right at the end of the trip i took it off completely and set the jib free-flying. Almost in spite she then developed a nasty habit of self cleating the jib sheet perfectly on one of the mast cleats during a tack. By the time i had gone forward and cleared the sheet she would sometimes tack back and foul the sheet again on the opposite side. One day i got so fed up with that while short tacking that i gave up, took the whole lot down and just motor-sailed. In time i could have sorted out all that detail but i don’t think i could have ever made her a significantly better balanced boat. Looks great, sails like s**t.
I think that had she ever shown a good quality as a sailing boat i might have been able to focus on that and maybe made the effort to put up with all the problems that i was going to have to deal with. There was just that one day right at the end when us and another gaffer slid past a couple of larger and more modern boats but i have to admit they weren’t exactly concentrating and i was ! i was also sailing much better angles and treating it as a downwind race. A much better test was the day we came around Portland Bill almost in company with a well sailed Sadler 26, he really scooted off on a slightly lower course seemingly going easily while we were really struggling with a 2 reef beat once again. I can’t even say that Inanda’s motion was kind, for example like the Frances 26, rather she bucked and pitched badly which of course made her slow and cranky. Quite a bit of my sailing has to be out in the channel in a fair chop and upwind, Inanda just could’t deal with it even as well as the Liberty does….and she isn’t a great upwind boat either. Possibly the most uncomfortable boat cockpit ever. If i make a comparison between Inanda and my Hunter liberty it almost seems an unfair one as they are some 60 years apart in design and although not too far apart in length and beam they are totally different in weight and shape. In a very light weather beat i might be able to outsail the liberty with the gaffer because of that big mainsl high up, the Liberty is at her weakest in light upwind conditions. Its also possible that the gaffer would stay with the Liberty most of the time downwind again due to having a lot more sail area but the Liberty i know will outsail larger boats in those conditions because she will accelerate quickly on the slightest puff of wind. The real comparison is how comfortable and light the Liberty is to sail compared to the Gaffer. One of Inanda’s worst aspects is the very poor ergonomics and the physical discomfort of steering her for long periods. I think you can realise that i had to do very long days at the helm on Inanda and they were long hard and very uncomfortable ones….at the end of the day i was relieved to stop. Its maybe an unfair comparison but i know i can steer the Liberty comfortably for hours when i need to, the cross channel trip i did before i got a tillerpilot is a good example….sure i was tired because i had been on the go for 30 hours but i wasn’t beaten-up in the same way as i was after just 14 hours on Inanda. The only way i could see to make Inanda a comfortable boat would be to completely re-design and rebuild the cockpit so that i could even sit comfortably for a while. I guess that brings me onto the final problem which is the amount of work involved now and in the future. During the voyage i started a project book which was initially a list of jobs and problems. That list gradually extended into several pages and separate projects within the overall job. I then started to make estimates for time and materials to do the work, material costs weren’t too bad but a realistic estimate of time given that i’m not a boatbuilder quickly pushed the work into hundreds of hours. The real problem is one i should have accounted for right at the start and that is of having to kneel for long periods , for example while cutting the scarph into each frame. Boatbuilder Nick Gates gave me a useful estimate in that they allow 4 hours to make and fit one new laminated frame section. To be honest i would much rather be sailing rather than kneeling inside an uncomfortable boat on a new knee replacement for days on end and maybe still not being satisfied with the end result. If it seems in the ‘shed-it’ post that this is a bit of a low point in my own sailing sailing life i guess that it is. The project has ultimately been a failed one although a valuable learning experience : my apologies for all the posts where i have been wasting time and effort on the projects. As i write the post the Liberty is back on her mooring and all-but ready to sail again, she has been and still is a great boat for my needs here although i really could do with a bit more living space and better offshore sailing ability. As i write the post Inanda has just been sold on Ebay after some problems with the site and the sale, hopefully she will soon be gone and i will be back to being ‘one-boat’ Steve again. The project has been a failure because i am trying to get a sailing boat prepared for a longer period of cruising, even up to a couple of years and mainly living aboard during that time. I thought that a small classic boat would do that and my time with Inanda strongly suggests that it wont…or at least not work in the way i needed. To some extent it feels like a wasted year and i can’t afford to do that. Freshly antifouled and ready to go. I am rapidly getting to the point where i really want to go not just sailing but voyaging again and without a deadline of having to be back in a job and an environment that i am liking less and less by the day. I have an enforced time-out now when i can’t sail anyway, in fact there won’t be much that i can do for a while except for my rehab, writing and researching boats. To a great extent i have even done that work and know that what i have got to do is just focus on having the funds together for a better boat. That still really depends on me selling the Liberty as well and that was a fail this years too. I won’t go into future plans much here except that i have a real goal of being ‘good to go’ not next spring (2019) but in the spring of 2020 with a viable small voyaging boat all set up and me back to full fitness. What i am going to do is use my recovery time to write a bit more seriously about some of the subjects i have been leaving aside for a while. Next Wind, light and peace.